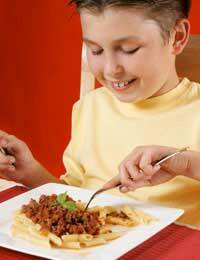 Is the Danger from Childhood Food Allergy Exaggerated? There are plenty of things to worry about if you are a parent. These days even the food we eat seems to be causing kids more and more problems. Of course the most frightening thing for any parent is the possibility of an anaphylactic reaction caused by a severe food allergy. But are these risks really increasing and how likely is any one child to suffer from such a severe allergy? It’s no surprise that many of us have a potentially exaggerated perception of the risks of food allergy. Tabloid newspapers and magazines write sensational headlines about ‘killer’ foods and trigger panic and fear amongst parents everywhere. Food allergy has the ability to scare parents more than some serious illnesses, like diabetes or asthma, and this is probably because of the potentially rapid onset of life-threatening symptoms. Of course, in reality, conditions like asthma can cause serious health problems for much larger numbers of children. The child with a severe food allergy is still a rarity. Are More Children Allergic to Food These Days? It might seem that way, but it’s very unlikely. Firstly, the media are keen to report new food allergy stories, so we’re probably more aware of food allergy than we were years ago. Also, childhood food allergy is being diagnosed more accurately and more often. The number of children prescribed epipens has increased in recent years and this has raised levels of awareness and levels of nervousness amongst kids and parents. It’s a nightmare scenario that is every parent’s worst fear. But just because your child has a food allergy does not, as the papers might have you believe, mean that they are at constant risk of immediate death. Eight children under the age of 16 died from food allergy between 1990 and 2000 in the UK. * That’s one death for every 16 million children each year. Even amongst children who have a food allergy, the risk of death is still low. Working on the principle that about 5% of children have food allergy, which means there’s one death for every 830,000 children who suffer from a food allergy. No child younger than 13 died from eating peanuts in the period in question. * Of course, statistics are of no comfort to the families of the children who lost their lives to an allergic reaction, but it is important to put the risk in context. Every day our children play outside, cross roads, undertake sports and activities and come into contact with illness. Every day contains risk for every one of us. The risk of death from a severe food allergy should be considered in the context of all the other risks we run on a daily basis. One condition that does seem to be linked to increased risk is asthma. * Studies have shown that children who experience fatal or near-fatal allergic reactions often have asthma too. This can be a reassuring fact of your child doesn’t get asthma, but of course, it brings no peace of mind to the parents of children with asthma. Of course, every parent worries about his or her child. It’s human nature. And if your child suffers from allergies the world can suddenly look like a dangerous minefield. But try to remember that the incidence of severe food allergy amongst children is tiny and there is no evidence to show that it’s increasing. As a parent there are many simple steps you can take to keep your child away from potential allergens. Check food labels, talk to your child’s school and to the parents of playmates. But don’t make your child feel afraid of the world. The risk of a fatal reaction from a food allergy is tiny and shouldn’t come to dominate your life – or that of your child.